After doing the Architectural Boat Cruise, Teena and I went off to explore Millennium Park. It was a hot sweltering day, not one made for walking, but we toughed it out. We entered the park from the north which made the Cloud Gate, also affectionately known as The Bean the first thing we came upon. One of the most unique and interesting sculptures in decades graces the promenade at Chicago's Millennium Park. 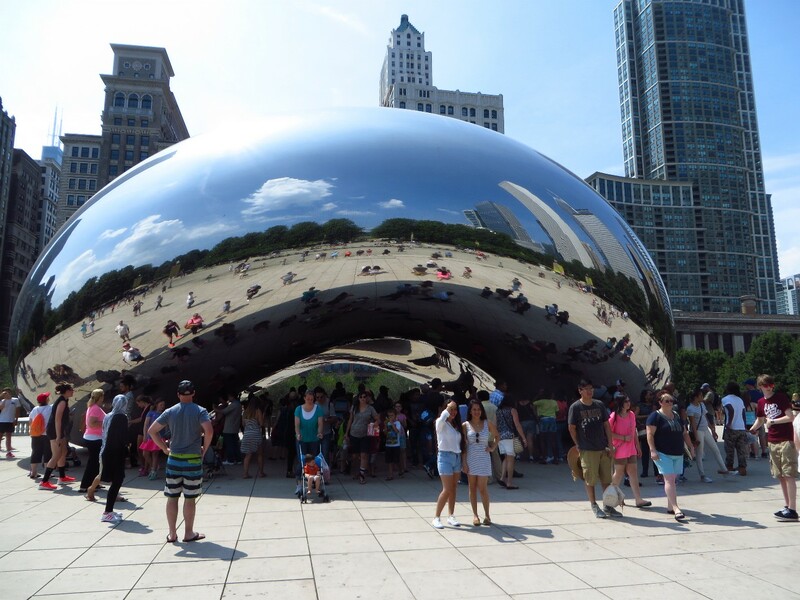 With "Cloud Gate" sculptor Anish Kapoor has created a work of art that holds something for everyone. It reflects the splendor that is the Chicago skyline. It plays tricks with the light and the sky. It is massive, giving it weight and importance. It is elegant -- balanced on its ends and without any color of its own. And finally, it is interactive, and lets the viewer become part of the art or stand back and let the simple act of walking, turning, or even just swaying change the visual presented by the sculpture. When it was unveiled in July of 2004, it was derided by some as unimaginative. Some branded it "The Electric Kidney Bean." That "bean" nickname stuck, and the public quickly changed its meaning from pejorative to loving. Here we are reflecting off it's surface. Looking up from underneath is freaky, with the very centre making it look as if we were looking down and a gruop of people standing below. You would have to see it to understand what I am talking about. Next we hit a unique splash pool enjoyed by many kids. What makes this so unique are the images of faces projected on the walls of the waterfalls. The images move which is a little freaky. Teena noticed there was a circular hole in each waterfall. She asked a security guard who explained that every seven minutes the images shoot out a blast of water. It was fun to watch as the kids all ran up and tried to get into the stream. Our next mission was to find the Clarence F. Buckingham Memorial Fountain but had a rest in the shade first with these two cool sculptures. Clarence F. Buckingham Memorial Fountain, one of the largest in the world, is located at Columbus Drive (301 East) and Congress Parkway (500 South) in Grant Park and runs from 8 a.m. to 11:00 p.m. daily, typically from April to mid-October, depending on weather. Times are subject to change when large events take place in or around Grant Park. 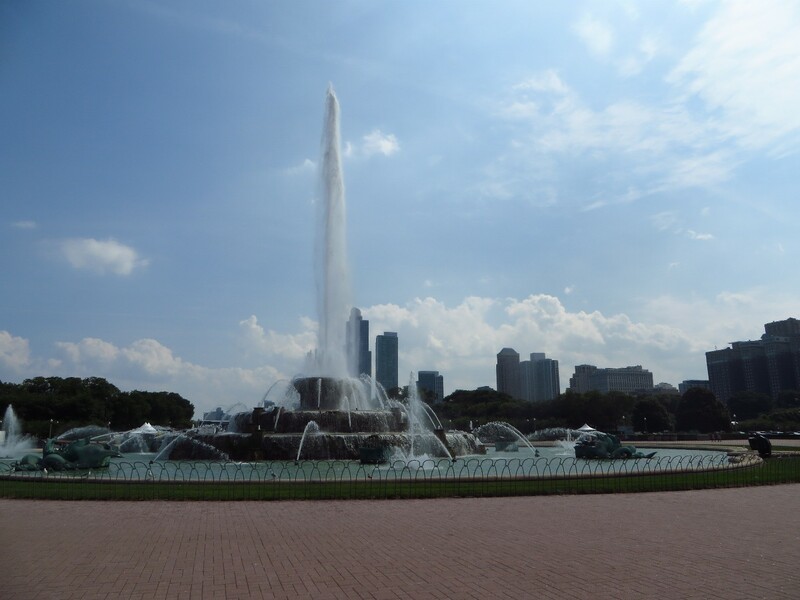 While in operation, every hour on the hour for 20 minutes the Fountain produces a major water display and the center jet shoots 150 feet into the air. The initial major display begins at 9:00 a.m. and thereafter, is every hour on the hour. Beginning at dusk, every hour on the hour for 20 minutes the Fountain's major water display is accompanied by a major light and music display. The final display of the evening begins at 10:35 p.m. It was sweltering and after so much walking we ended stopped for a pint at Millers Pub, then headed back home, passing this unique clock along the way. It was a fun but exhausting afternoon.